After finishing my undergraduate I spent a year working for a bank whilst trying to find a job related to the environment and using the chemistry I had studied during my course. Unfortunately, most positions required a masters degree or relevant experience. I therefore returned to university and was accepted for a PhD studying marine chemistry. This totally changed my career path, and I have continued in research since completing my PhD in 2007, working in the USA for over three years before returning to Plymouth five years ago. My degree completely changed my career path. I had been working in insurance for ten years but really wanted a job that was related to the environment. Passing the extended science foundation year before completing my degree in environmental science definitely led me to where I am now; I use the chemistry skills that I gained on my degree every day in my current research position. The most difficult thing about my job is that it’s not permanent. I am employed on fixed term contracts and I therefore have to re-apply for funding to keep my research going. This can sometimes be stressful, but not everyone chooses this path; most researchers gain permanent positions and therefore do not have this worry. My research involves going to sea and I have spent a lot of time on research vessels in different parts of the world. 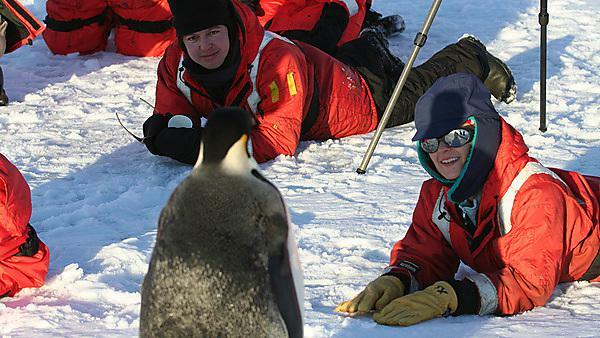 My favourite and most memorable experience would be the seven weeks I spent on an Antarctic cruise, where I was able to see penguins and step foot on Antarctic ice. Study chemistry and work hard, but always do something that you enjoy as that makes it easier. Plymouth was the only university that offered a foundation course that directly led onto the degree that I wanted to study. I was therefore ‘hitting the ground running’ when I came to start my degree which was an advantage. I also found Plymouth to be a very supportive and friendly place to study. How significant was the extended science part of your university journey? It was very important. I had been out of education for ten years and had never studied chemistry at school, but this was needed if I was going to study environmental chemistry as part of the BSc (Hons) Environmental Science course. Extended science not only gave me the knowledge and laboratory skills to gain access to my undergraduate degree, but it also gave me the confidence that I could actually do chemistry. Without completing the extended science course I would not be doing what I’m doing today, which is environmental chemistry. I learnt planning, which is essential in any job, report writing, and how to be an effective communicator. I also gained so much more confidence than I had before taking my degree. I think back now and I was a quiet mouse before starting my course. I do, as I’m still here. I have left Plymouth twice (after my undergraduate and again after my PhD) but keep coming back and now work with some of the lecturers who taught me on my undergraduate course. Yes, I would. I really enjoyed my time here. The environment is very friendly, the staff are approachable, and the environment is a supportive one. Plus, the South West is a lovely place to live.